The establishment of the Sub-Saharan League has launched Africa to a new position as a center of technological advancement. Fueling this hotbed of innovation is the Weyland Consortium—with their SSO Industries subsidiary proven to be a profitable venture. Despite their contributions to the SSL, SSO Industries has been shut out of construction for the potential second beanstalk on the banks of Lake Victoria. 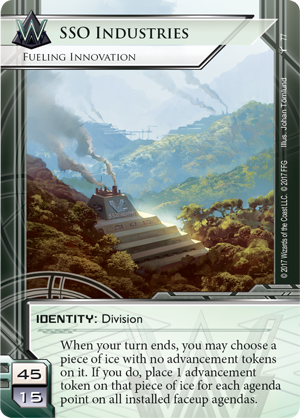 What plans does Weyland have for this beanstalk, and will their focus distract them from the Runners on the fringe, waiting for a chance to strike? 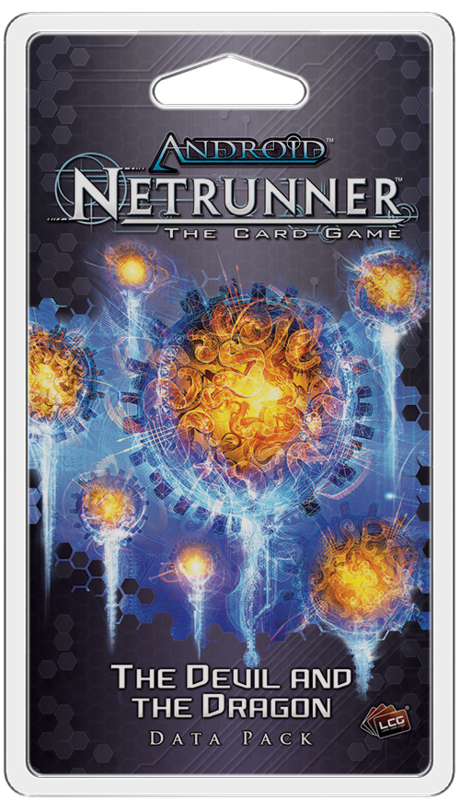 Fantasy Flight Games is proud to announce The Devil and the Dragon, the fourth Data Pack in the Kitara Cycle for Android: Netrunner is available for pre-order now from your local retailer or our website! 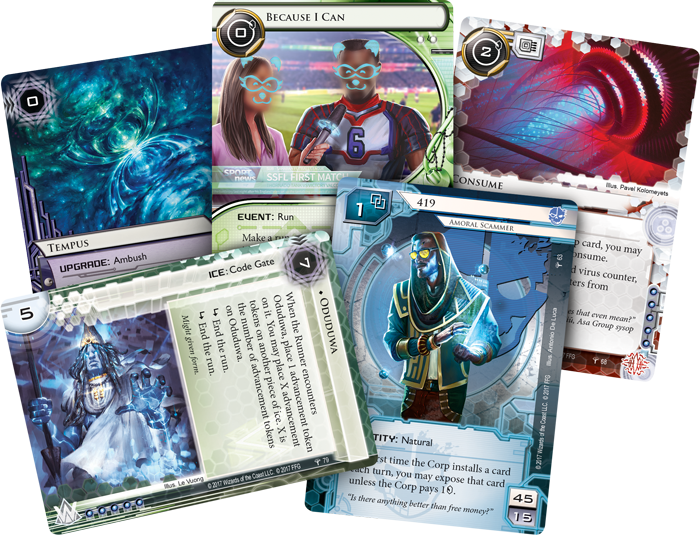 The Devil and the Dragon features three copies each of twenty new cards and continues to explore the Sub-Saharan League in the world of Android through the eyes of new Criminal and Weyland Consortium identities. The Net-criminal known as 419 (The Devil and the Dragon, 63) is an amoral scammer and schemer. Using his impressive set of skills, 419 dives into corporations, exposing not only their secrets but the very ice defending them. When you're playing as 419, the first time the corp installs a card every turn, you may expose it unless the corp pays one credit. This gives you the ultimate advantage as a runner—all-important information about the corp's plans. 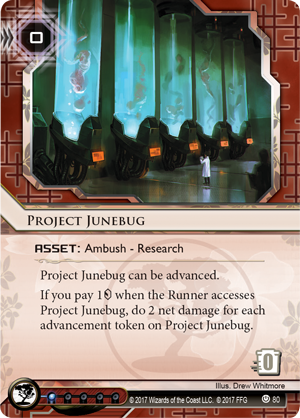 Being able to differentiate a Project Junebug (Revised Core Set, 80) from a Medical Breakthrough (Honor and Profit, 5) is essential to becoming a successful runner. Not to mention looking at ice can tell you what breakers you will need for a run before you make it, ensuring that you can deal with whatever the corp has waiting. Of course, the corp can pay a credit to deny you this opportunity. 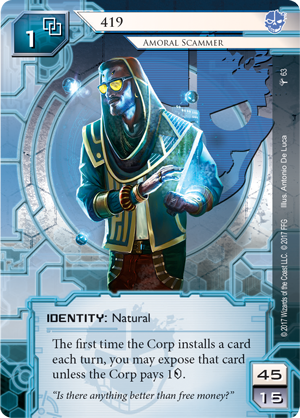 But Android: Netrunner is a game of economy, and the corp sacrificing a credit just to prevent you from getting a free look at one of their cards still plays to your advantage. For most runners, information is no good unless they can turn it into credits. Luckily, using this information to verify your Falsified Credentials can yield a tidy profit. When you play Falsified Credentials (The Devil and the Dragon, 64), you name a card type and then expose a card in a remote server. 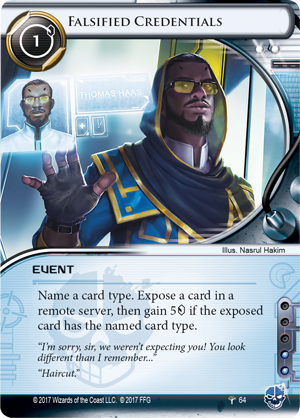 If the exposed card belongs to the card type you named, you gain five credits. While this can be a cinch for 419, other runners may have to do a little bit of guess work. 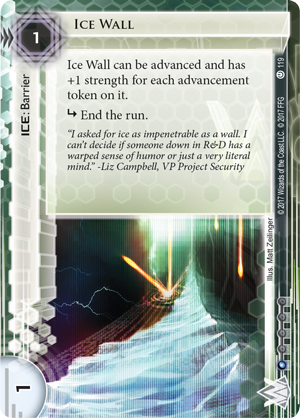 If the Corp begins advancing a card behind a wall of ice, you might assume it's an agenda and use Falsified Credentials to both confirm your suspicion and gain a little bit of economy along the way. If you end up being wrong, you may have just saved yourself from a deadly ambush. Either way, using Falsified Credentials gets you the information you need to succeed. By concentrating on infrastructure, mining, and building and supplying parts for HE3 nuclear plants, SSO Industries (The Devil and the Dragon, 77) is the Weyland Consortium’s gateway into the SSL. With the exception of the possible space elevator on Lake Victoria, there is little they don’t have a hand in. SSO Industries combines two of Weyland’s biggest themes into one explosive combo. When your turn ends, you may choose a piece of ice with no advancement tokens on it. If you do, place one advancement token on that piece of ice for each agenda point on all installed faceup agendas. 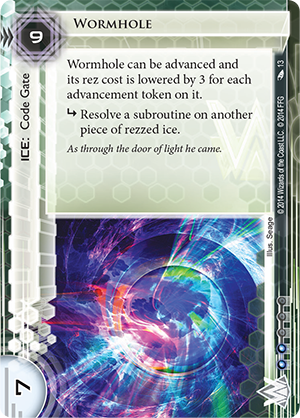 Weyland has always been the corporation that uses advanceable ice, whether it’s the strength boost found on Ice Wall (Revised Core Set, 119), the reduced cost of Wormhole (Order and Chaos, 13) or the threshold subroutines of Mausolus (Martial Law, 97). While these pieces of ice are all powerful in their own right, they take a hefty investment to reach their true potential. It takes clicks and credits to advance a piece of ice, sinking many of your resources into boosting your defenses when they could be used to advance agendas or rez other pieces of ice. SSO Industries circumvents this process, allowing you to potentially place multiple advancement tokens on a piece of ice at no cost to you—if you have a faceup agenda installed at the end of your turn. Weyland has no problem advancing its public agendas faceup, in plain view of the runner. After all, Weyland believes fear of retaliation will keep the public in line. What they give up in secrecy they gain in bonuses from advancing these agendas. 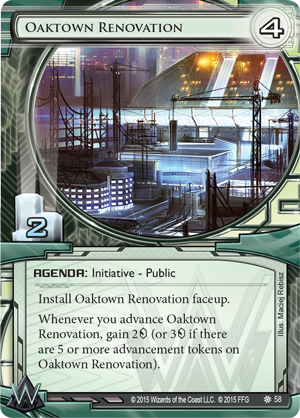 Oaktown Renovation (Chrome City, 58), for example, pumps up your economy while it is on its way to being scored. The Devil and The Dragon introduces a new, dangerous public agenda for Weyland. While City Works Project (The Devil and the Dragon, 78) doesn’t give you any advantage while you are advancing it, the runner will have to take a measured risk to steal it. 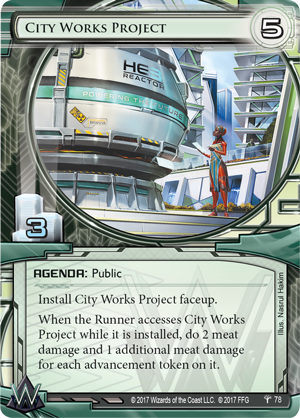 When City Works Project is accessed while installed, the runner takes two meat damage and an additional meat damage for each advancement token on City Works Project. If you install City Works Project and advance it twice during your turn, not only will the runner carefully have to maneuver through your defenses, they will also have to find a way to deal with four meat damage when they finally make their way to the agenda. As an agenda worth three points that protects itself, City Works Project combos well with SSO Industries. 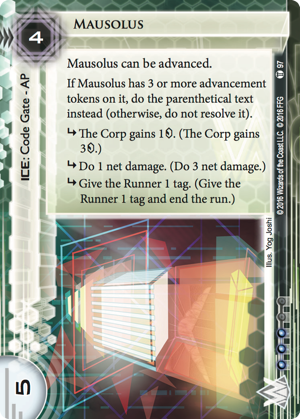 The turn you install City Works Project, you’ll be able to place three advancement tokens on a piece of ice for free—enabling the more advanced subroutines of Mausolueus or making Wormhole free to rez. With an important foothold in Africa, SSO Industries protects their public investments like few other Corps can. 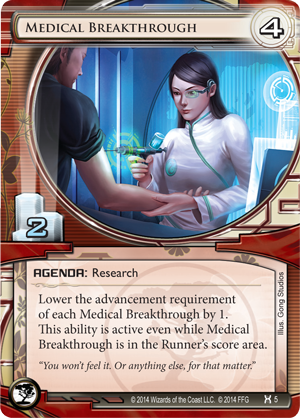 Runners know what Weyland is capable of when they feel slighted. What sort of vengeance does SSO Industries have cooked up after losing the contract for the Lake Victoria Beanstalk? Regardless of the answer, runners like 419 will always be hanging around the fringes, waiting to siphon even more credits and secrets from the Corp. What side will you choose? Make a profit and pre-order The Devil and the Dragon (ADN53), coming in the first quarter of 2018, from your local retailer or from our website!